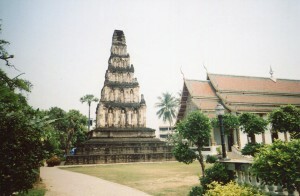 One of the reasons why Thailand has one of the most fascinating cultures in the world is its regional variety. We saw some of the enchantments of northern Thai art earlier today. 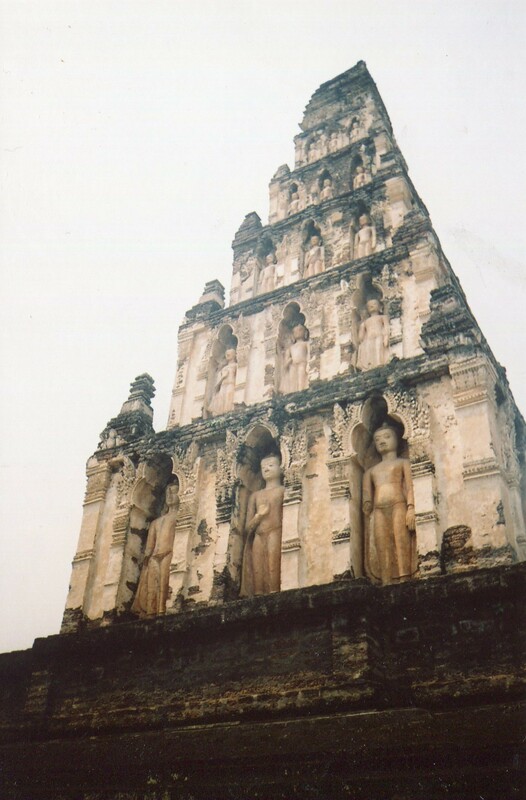 The town of Lamphun was the center of a very special kingdom. It was called Haripunchai. 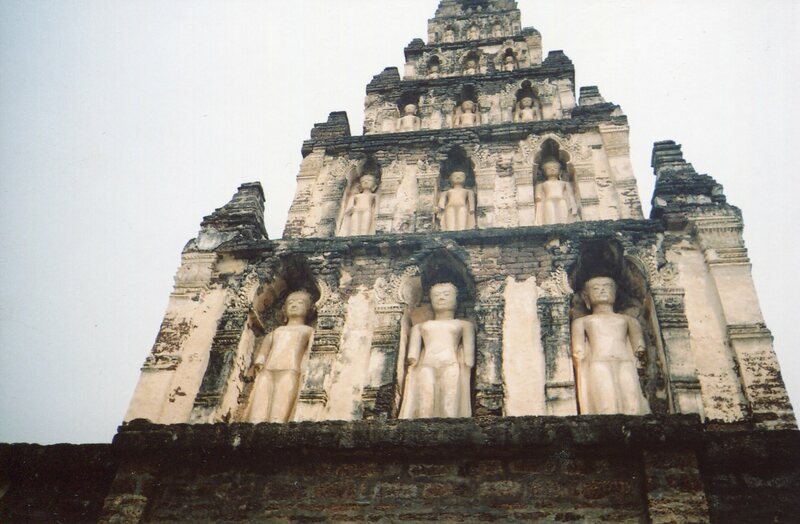 Lanna’s king Mangrai annexed it in 1281, but it was one of Thailand’s most influential artistic centers before then. 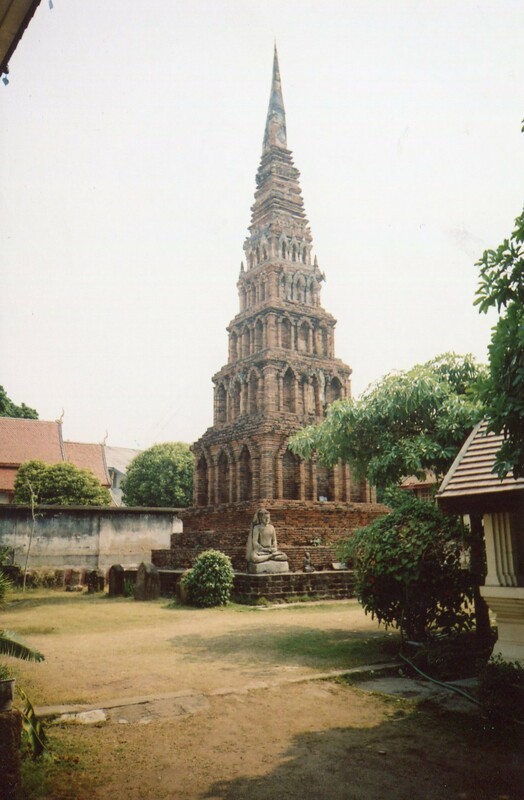 From the 11th to the 13th century, this state battled the Khmers for independence. But during that time, it created art forms that spread to both Chiang Mai (Lanna’s capital since 1296) and Sukhothai. Earlier today we saw that Thai artists took forms from Sri Lanka and India, and made them more graceful by lengthening and narrowing them. Haripunchai created its own variety. Its characteristic stupa (also called a chedi) is a tall narrow pyramid with 5 increasingly small levels. Its slender outline makes it more light than bulky. 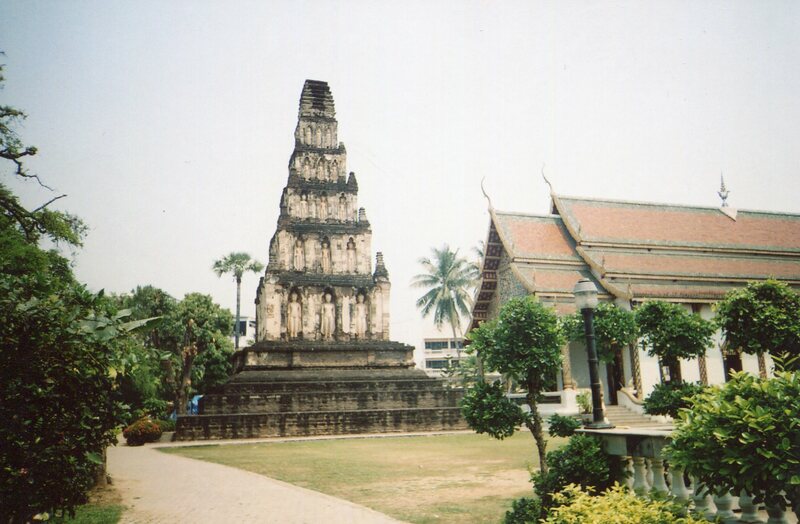 It doesn’t spread an overwhelmingly large horizontal frontage, like Angkor Wat does. Instead, it playfully rises and tickles the sky. Each side of every level contains three niches with a Buddha statue in a standing position. So five layers of trinities calmly smile and bestow grace on all quarters of the realm. 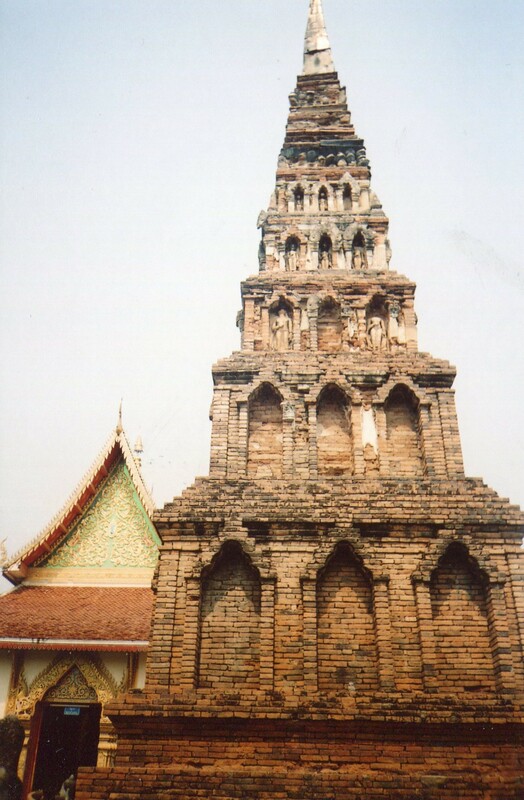 Lamphun’s Wat Ku Kut sports a stupa that stands next to a large vihara in a style from Ayutthaya (with a stately high roof). As you can see in the above picture, both buildings complement each other. The gossamer spire and the regal hall balance each other. Both are surrounded by greenery. The interplay of art forms thus takes place within nature’s abundance. Art tames the intense power of life in the tropics and makes it graceful.